It’s been about a decade since the Mercedes GLK SUV first came out, and I still think its design is one of the best examples of “just the right amount of rugged.” Early GLKs are not that expensive now, so they’re primed for lowkey light-duty overland conversions. Mercedes-Benz G-Wagens seem oddly immune to depreciation, but you can find an old GLK for around $10,000 these days and probably less if you look hard. The GLK’s 4Matic all-wheel drive system isn’t nearly as robust as a G’s triple-locked straight-axle setup, but if you pair it with a solid set of all-terrain tires I’m sure Mercedes’s cute ute would be every bit as capable as a Subaru. And you don’t need much more than that to get pretty far from pavement. 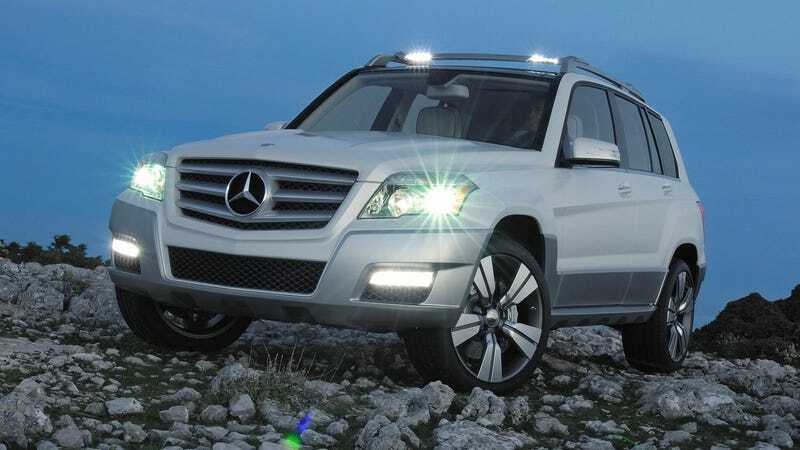 A GLK is also a hair shorter than a Toyota RAV4, making it maneuverable and... I was going to say “efficient,” but a 2010 GLK350 4Matic could apparently only manage 18 mpg in combined driving. Oh well. Still a lot better than most heavier SUVs. I really do think one of these would look absolutely awesome with four HID spotlights over the windshield, knobby tires, a swing-out rear tire carrier with a RotopaX mount, and maybe, just maybe, some bolt-on polyurethane fender flares with wheel spacers to fill them out. A basket roof rack or rooftop tent would probably fit the vibe as well. The interior is so chunky, it already looks like it was lifted out of an SUV from back in the days when all SUVs meant business off-road. Man, 2010 looks like a long time ago in there, huh. But as dated as this cabin looks, I have to say, I like it. Mercedes seemed to agree with my thesis about tossing parts onto one of these, actually, and one of the SEMA builds commissioned around the GLK’s launch was decked out in a semblance of off-road garb. The Four Corners Rock Crawler vaguely illustrated what I’m talking about, but the execution suffers from a case of caricature and the look is blown. Are those fender flares made of vinyl graphics? Mercedes got a little closer to doing this idea correctly with the Freeside concept, which was showcased at the vehicle’s introduction alongside the more luxury oriented Townside concept to sell the duality and versatility of the car. But yeah, basically I’m just saying somebody should do a more committed version of that, without going all goofy and having one of the rock sliders be a skateboard grinding rail. This has been discussed on forums a time or two, but now that the GLK has depreciated, the idea of screwing around with modifications makes a little more sense. This occurred to me this week as we were discussing the new Mercedes GLB concept as an upscale equivalent of the Jeep Renegade. Why wait for Mercedes to make another watered-down mass-market SUV with an aura of adventure? Just get a first generation GLK and beef it up with some bolt-on off-road mods. If somebody has already done this, by the way, I sincerely hope I get to see pictures in the comments here.